A modern smartphone is more than just a portable navigator, internet browser, camera and music player. Now your Android phone can also help you in dealing with mundane day-to-day chores around the house and kitchen. With new timer apps, your device can notify you when your tea has boiled, your eggs are cooked or when your wash cycle is finished. Timers4Me offers you multiple timers to manage your busy schedule. 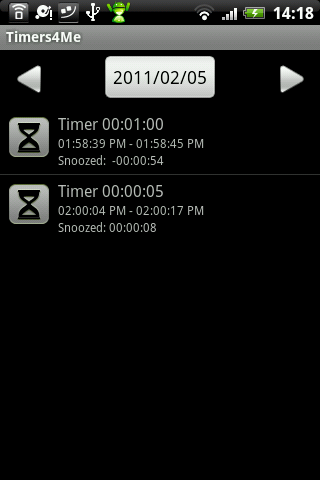 The fact that you can run multiple timers at the same time is what sets Timers4Me apart from other Android timers. This can be an extremely useful feature. On top of that Timers4me gives all the options and settings you could expect from an app of its kind (see Screen & Controls). Having a good timer is important and Timers4Me does a really good job. I’m still not positive whether Timers4Me is going to stay on my phone for a very long time. Once a timer has started a countdown, you can access it an any time by opening it from the notification bar. The notification bar also displays the start and end times of the given timer. A pop-up window saying “Time’s up” notifies you when the timer is over along with a ringtone. At this stage, you can choose to end the timer, restart or turn on snooze mode. All of the essential options can be found in Menu button/Preferences. Here you can adjust whether the timer should ring when the phone is in silent mode or when you are in the middle of a conversation. Adjusting the ringtone, alarm duration and volume can be done here as well. Pressing the exit button suspends all timers and completely closes Timers4Me. Timers4Мe not only offers all the necessary options for its purposes, but the app is also extremely easy to use. Keeping track of your tracks on the notification bar is a very useful feature here. 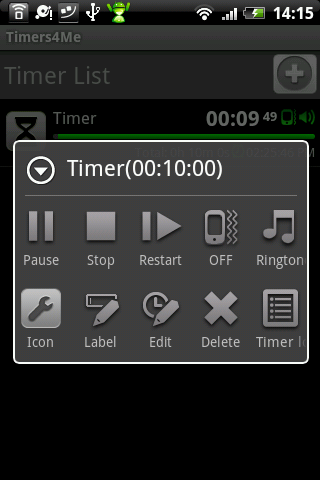 I haven’t come across another timer app that offers so many different important features. 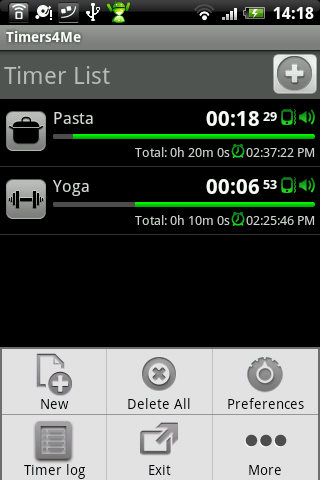 Timers4me might not be the prettiest looking app, but it definitely gets the job done. Timers4Me runs smoothly and reliably without any problems. All of the timers went off at exactly the right time. Excellent for boiling an egg.